Learn to play Chuck Leavell's stride blues piano. Leola Manning’s 1930 recording, “The Blues is All Wrong” is an unlikely candidate for IROCKU to showcase Chuck Leavell’s signature keyboard techniques. This song was recorded two decades before the pioneers of rock piano gave us our first rock piano tunes such as “Fat Man” (Fats Domino) and “Rocket 88” (Jackie Brenston and Ike Turner). The original version of “The Blues is All Wrong” has a bouncing blues stride which propels the power of Leola Manning’s gospel infused voice. In 2012, Chuck re-recorded this tune on his “Back to the Woods” album with legendary soul vocalist Candi Staton and, in doing so, he shares with us a medley of the essential techniques he’s used throughout his legendary career. This Piano Rock Essential Series is not about the song. In this series the song is the messenger not the message. The message is a multi-part video series that covers both right and left hand piano techniques that Chuck has used throughout his career. If you want to learn the fundamentals behind Chuck’s epic performances ranging from “Jessica” ( Allman Brothers) to “Honky Tonk Women” ( The Rolling Stones”) and everything in between, this series is the place to begin. The series covers left-hand stride and walking bass lines, and right-hand scales, chords and patterns based on blues, minor, major and pentatonic scales. All are fundamental elements of Chuck’s legendary style. Chuck wraps up this video series with a few practice tips of his own. But to teach the series, Chuck chose pop and jazz keyboardist, Alfie Hole. In 2014 Alfie won an international jazz competition of more than 9000 competitors, establishing him as one of the top young contemporary keyboardists in the world. Thanks to a jazz training at renowned American music institutions including Berklee and The New School for Jazz, Alfie is in demand internationally and has travelled worldwide performing, arranging and recording. “Chuck Leavell’s Stride Blues Piano” video series covers techniques that Chuck has used throughout his legendary career. It begins with an overview of the 8- bar blues form used in the recording, “The Blues is All Wrong”. The first half of the series teaches left-hand stride techniques and introduces elements that Chuck has learned from his early mentors, such as Dr. John and Ian Stewart, to spice up the standard stride pattern. Including leading with swung eighths, changing the bass note, and walking bass lines. The second half of the series teaches right hand scales, chords, shapes, and phrases. It covers outlining chords, strong and passing tones, thirds, sixths, triads, moving from tension to resolution and dominant 7th and 6th chords. The concepts are not difficult but you will learn how Chuck applies these musical elements to create his signature style. This series is for intermediate and advanced students. The series includes sheet music of all the techniques discussed and a solo piano arrangement. Thank you for your interest in irocku. Please submit this form to receive access to your FREE Lesson. Along with this lesson, you will also have access to all 7 levels of our "You Can't Always Get What You Want" lesson. Start rockin! This lesson covers basic left-hand stride piano. A solid stride technique is key to laying down the groove. For this stride we alternate between the root of the chord as the bass note and two–note chords made up of the 3rd and dominant 7th of the chord. The video teaches the root-chord combinations for each of the chords in this form. This all might sound pretty basic for advanced or classically trained players. And yes, the music theory behind this is not complicated. But playing a smooth and steady groove across all the chord changes is crazy difficult. Expect to be humbled! Master this stride form before advancing to the next videos. Along with the video, sheet music is provided that covers root-chord combinations for all keys. Once you’ve mastered the stride groove you’re ready to spice things up a bit. In the first of three videos you will learn how to lead the stride groove with swing eighth notes. For those who don’t know how to ‘swing’, we teach how to count and play a swing eighth note. We then teach you how to lead each bass-note and two–note chord pattern with the swing 5th note of the chord. In the second video you will learn how to create harmonic movement between the chord changes by changing the bass note of the stride pattern. Starting with the root of each chord, the bass note of the stride pattern moves either up or down the mixolydian scale to reach the next chord destination. Semi-tones are added along the way to fill in gaps in the count. As an alternative to moving up or down the mixolydian scale you will learn how to change the stride bass note by moving between the chords tones of the dominant 7th chord. Practice these movements in as many keys as possible so the movements become second nature. If you have to think through each movement it will be impossible to hold down the stride groove while improvising with your right hand. The third video teaches how to break up the repetitiveness of the stride groove by introducing walking octaves using swing eighth notes. Along with the two approaches taught in the previous video (walking up or down the mixolydian scale and using the important dominant 7th chord tones) we introduce walking from the root to the third. Along with the videos, sheet music is provided of all the techniques discussed. In this video we debunk the common misconception that learning to play up and down scales is the building block for improvisation. In most improvisations it’s the shapes of the scales that are the beginning, ending, and everything in between. It’s easier to develop muscle memory with shapes than with scales. In this video you will learn the five shapes of the major and minor pentatonic scales along with the granddaddy of them all, the shapes of the minor pentatonic blues scale. Alfie has a very smooth and tasteful style in how he phrases the different shapes. Try to mimic Alfie’s phrasings as you learn these shapes. In time you will develop a style and phrasing that is your own; which is the ultimate goal. In the first video we teach ‘strong’ thirds of the chords and how these strong thirds are used to ground your playing. All of the thirds that are available to incorporate into your playing are derived from a combination of the major pentatonic, the minor pentatonic, and the blues scale into one single scale- which we fondly refer to as Chuck’s blues scale. This is hands-down the scale that Chuck uses most frequently in his playing. Once you’ve mastered thirds, it’s time to flip them on their heads and turn them into sixths. An inverted third is a sixth. Everything that we taught in the previous video applies to sixths as well. Such as moving from tension to resolution by moving from a passing sixth to a strong sixth. Or breaking up the sixth to create rhythmic interest. Play, experiment, and explore. The final video shows how we can use basic chords alone to develop rich melodic phrases. In this video Alfie analyzes two of Chuck’s licks which ties everything you've learned together. It begins with moving from the minor chord to the major chord. A technique that every bluesman has in their toolkit. You’ll then learn how to arpeggiate the chords, a technique used commonly in New Orleans playing. We then infuse some gospel into the mix by showing how to move from the I chord to the IV chord and then back to the I. The series ends by showing how to move between the dominant 7th of the chord and the sixth. A technique that tends to soften the blues sound a bit. Along with the video, sheet music is provided that covers these techniques, in all keys. Chuck wraps up the series by re-iterating the importance of locking in a solid left hand groove and then adding right hand frills only once you’ve mastered the left hand. If you enjoy playing in this fabulous rock/blues genre, this video series will provide you with a lifetime of material to learn, master, and perform. Keep rockin! This lesson also includes a solo piano arrangement of "The Blues is All Wrong". This arrangement is for advanced students so work your way through all the lessons before giving it a try. How do recommend becoming fluent in different keys? Is it a matter of simply picking a key, say C, and working on improvising in that key, and then eventually moving onto another key? Are there certain keys that are “musts” to learn due their popularity in music? Piano players typically first learn C because there are no sharps or flats but the most popular keys on the guitar are A and E. If you plan on playing rock or blues with guitarists than these are without a doubt the most useful keys to learn. We’d suggest starting with A. Learn the major, minor, pentatonic, blues, and mixolydian scales. Learn to improvise using the blues progression(I,I,I,I,IV,IV,I,I,V,IV,I,I) and then using the four chord progression (I,V,vi,IV). Once you learn A we’d suggest moving to E, then G, then C, then D. Db/C# is also a popular key to learn because it is all the black keys. 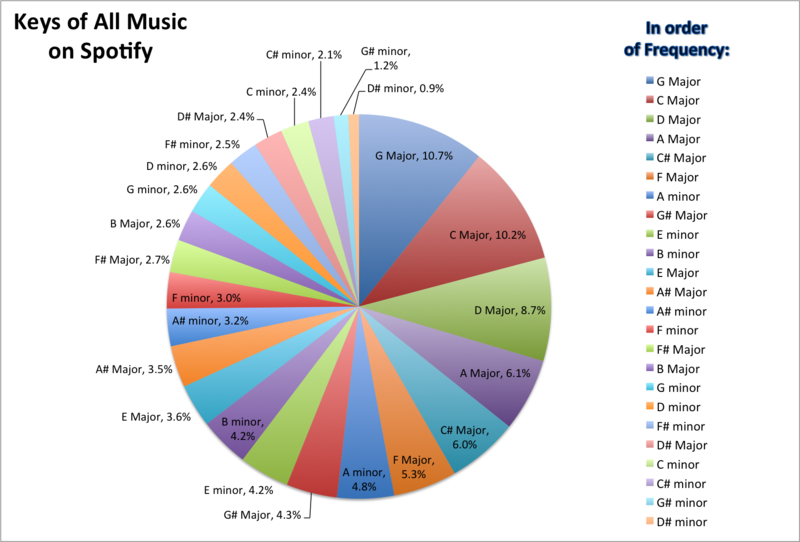 Here’s a chart that Spotify created based on keys most often found on Spotify. Very helpful! Great answer. I’m loving this course. Wow, what a great investment! I’ve been stuck on a blues scale for years. This will open up a whole new world for me. I can’t get the PDF from Lesson #1. It says “signature does not match”. Lessons #2 – #5 printed ok. Please refresh your browser and try again. Start rockin! Chuck Leavell 2012 "The Blues is All Wrong"
Leola Manning 1930 "The Blues is All Wrong"
Fats Waller "Handful of Keys"